It's coming folks. I'm talking about football season, and a good sign of this is the annual Big 10 Football Media Days in Chicago, which occurred last weekend at the Hyatt McCormick Place in Chicago. Talk, as one would expect, focused on Penn State and all of the troubles they are enduring since the heavily imposed sanctions were levied a couple weeks ago. This will be the second season of the split divisions since the addition of Nebraska at the start of the 2011 campaign, and once again, the conference will be split up into the Leaders and the Legends. The Leaders division includes Illinois, Indiana, Purdue, Ohio State, Penn State and Wisconsin, and within this division there are three new coaches and two teams on probation. The Legends division contains Nebraska, Minnesota, Iowa, Michigan, Michigan State and Northwestern, and seems to be the more balanced of the two divisions. Here is a quick preview of all 12 teams in the conference, and the outlook of the teams as the season begins to unfold. Tim Beckman was named the 23rd head coach of the Fighting Illini last season, and brings with him an energy level that has not been seen around the Urbana-Champaign campus in many years. Beckman came to Illinois from Toledo, where he compiled a 21-16 record over 3 seasons. including 2 bowl appearances. 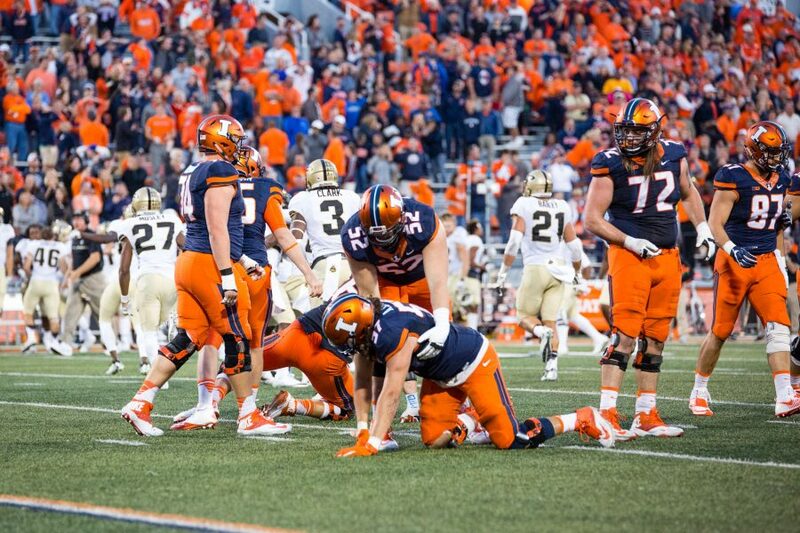 The Illini lost a couple of key players last season, most notably Whitney Mercilus, but return a lot of the offensive unit, including quarterback Nathan Scheelhaase. The offensive line, which protects Scheelhaase, will be inexperienced, as only Hugh Thornton and Graham Pocic return from a year ago. Beckman has said time and again that the best 11 athletes will play, even if that means having three tight ends on the field at the same time. Also, look for Terry Hawthorne to see some action on the offensive side of the ball at receiver, in addition to his normal position of cornerback. The Illini are coming off of back-to-back bowl victories for the first time in school history, so the pressure will be on for Beckman to keep the Illini moving in the right direction. Indiana finished 1-11 last season in Kevin Wilson's first season, one that he would like to forget. The Hoosiers return seven players on the offensive side of the football, including quarterback Tre Roberson and center Will Matte. Defensively, the Hoosiers welcome back eight starters from a year ago, led by Adam Replogle and Larry Black Jr. Indiana has the potential to start off the 2012 season with a couple of victories, but getting back to respectability may take longer than Wilson intends. Purdue comes into the 2012 season brimming with the most confidence that they have had in quite some time, thanks in part to a lot of letterwinners returning on both sides of the ball. The Boilermakers will be stacked on offense, especially at the quarterback position, as all three signal callers return from a year ago. Starter Caleb TerBush will start the season behind center, but don't be surprised if Coach Danny Hope uses sixth year redshirt senior Robert Marve or junior Rob Henry at least part of the time back there. Marve saw considerable action at the position in 2011, and Henry is versatile enough to play any of the offensive skill positions, according to Hope. Defensively, the Boilers return a stable of athletes, led by Ricardo Allen and Kawaan Short. Allen, diminutive in stature, returns to anchor the secondary while Short patrols the defensive line. Frankie Williams also returns for Purdue on defense, a unit that has played together for a while and are beginning to come together as a group. Purdue finished 7-6 in 2011, including a 37-32 win over Western Michigan in the Little Ceasars Pizza Bowl in Detroit, Michigan. Wisconsin is coming off one of the more successful seasons in their recent history, defeating Michigan State 42-39 in the inaugural Big Ten Championship game at Lucas Oil Stadium in Indianapolis. That win propelled them into the Rose Bowl, where they were defeated 45-38 by Oregon. The Badgers, under coach Bret Bielema, return several starters from a year ago, including running back Montee Ball. However, earlier this week, Ball was involved in an altercation on the Wisconsin campus where he was jumped by several men. Bielema said this week that Ball probably won't be ready for the start of training camp, which begins on Monday. That would be a critical blow to the Badgers if Ball isn't ready for the start of the regular season, because they relied on him so much last year. Also returning is wide receiver Jared Abbrederis, who caught 55 passes for 933 yards and scored 8 touchdowns. The Badgers go into the season as the favorite to win the Leaders Division. Ohio State will have a familiar face on the sidelines this year, as Urban Meyer comes out of retirement to coach the Buckeyes. Meyer, who led Florida to two national championships, walked away from the Gators and into the broadcast booth, where he stayed for only a year when Columbus came calling. The Buckeyes will be ineligible for a bowl game this season due to their punishment for the "tattoo gate" and the selling of memorabilia from other games. Ohio State finished 6-7 in 2011, including a 24-17 loss to Meyer's former team, the Florida Gators in the Gator Bowl. Gone are a lot of the players that put the Buckeyes on probation, but quarterback Braxton Miller returns, as does fullback Zach Boren and tight end Jake Stoneburner. Butkus Award candidate Etienne Sabino returns at linebacker to lead the defense, as well as defensive linemen Jonathan Hankins and John Simon. With no postseason aspirations or a chance at the Big Ten title game this season, the Buckeyes will aim for a successful season and hope for the best until they are eligible again. Then there is the case of Penn State. So much has happened in State College over the past year, with the Jerry Sandusky sexual abuse scandal that led to the firing of legendary coach Joe Paterno. Paterno would die nearly three months later, due to complications of cancer, among other things. The sanctions that followed in the wake of the scandal has pretty much crippled this program, as one of the stipulations included players being able to leave the school and transfer to another school and be immediately eligible without penalty. Several players have taken advantage of the situation, including tailback Silas Redd, who transferred to USC earlier in the week. The Nittany Lions finished 10-4 in 2011, including a 30-14 loss to Houston in the Ticket City Bowl in Dallas. However, what is to come for the Nittany Lions will further define the program, because after all, this whole situation could have been avoided, but nothing was done. Michigan appears to be the odds on favorite to come out on top in the Legends Division, since they return quite a few starters on both sides of the ball, led by quarterback Denard Robinson and wide receiver Roy Roundtree. Running back Fitzgerald Toussiant also returns for the Wolverines, who finished 11-2 in 2011 under first year coach Brady Hoke. The Wolverines defeated Virginia Tech 23-20 in the Allstate Sugar Bowl Classic in New Orleans, Louisiana, and Hoke expects more from his Wolverines in 2012. The offensive line also returns three players from a year ago, and defensively, Michigan returns their entire linebacking corps, as well as three quarters of their secondary. The Wolverines have high expectations for this season, and don't be surprised if they are representing their side of the conference in the Big Ten title game come December. Michigan State is coming off an exceptionally successful season on 2011, finishing the season 11-3, including a trip to the Big Ten Championship game against Wisconsin, a game they lost 42-39. The Spartans bounced back from that loss to defeat Georgia 33-30 in triple overtime in the Outback Bowl, but lost a key member of their offensive unit when quarterback Kirk Cousins graduated. Michigan State will have a new signal caller under center for the first time since 2009 this season, as young Andrew Maxwell takes over for Cousins, who is now in the NFL. The Spartans return most of their running backs from a year ago, but must replace three wide receivers and two tight ends, most notably wideout B. J. Cunningham, who was one of Cousins' more prolific targets. The offensive line loses nobody, so it will remain one of the strongest in the conference and should give Maxwell a lot of protection. Defensively, the Spartans lost two interior linemen from last season, but return their entire linebacking nucleus, making them still a force to be reckoned with. The goal is still to get back to the title game, but with a lot of new faces in East Lansing, that might be a tall order. Nebraska finished their first season in the Big Ten 9-4, including a 30-13 loss to South Carolina in the Capital One Bowl, and look to contend once again for the Legends Division crown. The Cornhuskers return their starting quarterback Taylor Martinez, as well as their top running back of a year ago Rex Burkhead. Nebraska returns a bunch of offensive linemen, but only three that had starting experience. Defensively, they return three players that started a year ago, while the linebackers return intact, including senior Will Compton. Coach Bo Pelini will have the Cornhuskers ready to play, but a lot depends on Martinez and how well he can generate the offense in Lincoln. That will be the determining factor in how successful they will be in 2012. Minnesota is coming off of a disappointing 3-9 season in Coach Jerry Kill's first season as bench boss of the Golden Gophers. Kill, who battled some health concerns in 2011, is back at full strength, and he hopes for improvement for his football team as well. Quarterback MarQueis Gray returns for Minnesota from a year ago, but he lost his top receiver DaJon McKnight. The offensive line will be young, as several redshirt freshmen and sophomores dot the roster. Defensively, the Gophers are a little more experienced with depth, but still will need to make plays. The Gophers begin the season ahead of most of the rest of the conference when they battle UNLV on Thursday, August 30th. Iowa enters the 2012 season with the most experienced coach in the conference in Kirk Ferentz, who is beginning his 14th season in Iowa City. Longevity has been the norm for the Hawkeyes, as Ferentz succeeded Hayden Fry, who was at Iowa 20 years. The running back position will be a concern for the Hawkeyes this year, but they return their starting quarterback James Vandenberg from a team that finished 7-6 overall, including a 31-14 loss to Oklahoma in the Insight Bowl. Ferentz says a lot of the positions, both offensively and defensively, are up for grabs. Iowa has the potential to contend for the Legends Division crown with Michigan and Michigan State, but they will need to have some things fall their way if that is to happen. Northwestern, or who Tim Beckman commonly refers to as "that team up north", is coming off of a 6-7 season, which saw them qualify for their fourth straight bowl game, the first time that has ever happened in Evanston. The Wildcats lost that game 33-22 to Houston in the Meineke Car Care Bowl in Houston, Texas, but according to Pat Fitzgerald, they are in pretty good shape to get back to a bowl game again. Leading the Wildcats under center will be Kain Colter, who saw some action back at the position a year ago when starter Dan Persa went down with an injury. Northwestern had an up and down season, starting the year off 2-0, then losing five straight games before winning four of their final five games to become bowl eligible. The key to the Wildcats continuing this recent success will be doing the things that Coach Pat Fitzgerald has instilled on them in the past. Plus, a little luck wouldn't hurt as well. Back to the Illini for a minute, since this blog is called The Illini Guy Report. Coach Beckman started their pre-season workouts on Monday at Rantoul, and in contrast to the past few years, they are only going for one week up north. Also, there is no scrimmage this year at Rantoul, but according to Beckman, they may revisit that idea in future years. "I really like it, it reminds me of past seasons going to Cleveland Browns training camp. There is really nothing like it", Beckman said on Tuesday after practice. The workouts are free and open to the public, and they will remain in Rantoul until Sunday, when they will return to Champaign for the Illini media day, followed by Fan Appreciation Day. Fans will have the opportunity to meet players and coaches, and get autographs from them from 5-6 pm on the new turf of Memorial Stadium. Practice resumes on Monday in Champaign, which will then be closed to the media and public.